I'm just going to come out and admit it. I am that mom. The one who lies to her kids. I may have, on many occasions, lied about the fact that a toy didn't make noise. I have yanked batteries before they noticed how it was supposed to work, or let batteries die without replacing them. What? I believe in the power of imagination! And then, sometimes I'm delighted to discover toys that don't require batteries and that, by their simple, ingenious designs, are all about promoting the power of imagination. When they happen to be green toys, well, that's just icing on the cake. All Sprig Toys are eco-friendly and unbelievable adorable. I guarantee that you won't be able to resist picking up the cute little people and I doubt that you'll leave their site without thinking of a few little people in your life who would love to create their own adventures with these toys. I was fortunate to receive our buddy Captain Owen and his rugged little boat. Is he a fisherman? Is he a dolphin watcher? Depends on the day and who's telling the story. - Parents will love the eco friendly, made from recycled materials toy. 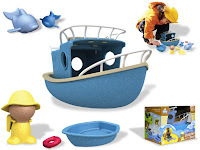 Kids will adore the tough little boat and the adorable dolphins. 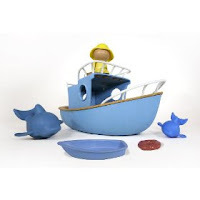 - The toys are made from Sprigwood, a mix of recycled plastic and reclaimed sawdust. It's smooth to the touch and very pleasant to handle. - Two boats! For even more imaginative play. - Waterproof, so great for pool, beach, or even tub time. Dolphins are the only hollow creatures, but they are well designed with no place water can stay trapped and make the toy moldy. Everything else dries nicely. - The box is more than just a box! It has cut-outs that add a whole other dimension to the toys inside. - Our kids aren't used to having toys that have to be fuelled so far by their imaginations. Captain Owen doesn't even have a face. It takes a while for them to get engaged and start having fun with this, but once they do it's hard to tear them away! Disclaimer: I am in no way affiliated with Sprig Toys. I was given a Dolphin Explorer Boat for review purposes and was in no other way compensated for this review. The opinions and thoughts expressed in this post are mine and mine alone.